Smart phones, social media, email, desktops, laptops and tablets. Technology has delivered a world of opportunities – and an epidemic of distractions. Those distractions are harming the health and performance of people and the businesses they work for. So how can we all avoid information overload, and succeed in life and work? 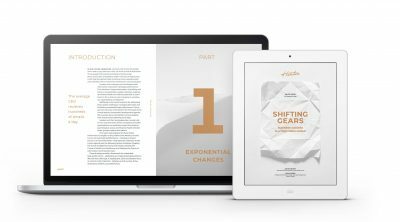 Davos, Switzerland – January 25, 2018 – A new white paper has the answers, and it comes from leading high-performance coaching and digital wellbeing provider, Hintsa Performance. ‘Shifting Gears: Business Success in a Fractured World’ examines the issues and offers solutions for staying focused, nurturing skills, improving health, and boosting performance. That’s vital in business, with evidence showing that the share prices of companies focusing on health and wellbeing significantly outperform those of their rivals. The paper was unveiled at the World Economic Forum Annual Meeting 2018, mirroring the event’s theme: ‘creating a shared future in a fragmented world’. It reveals some striking insights. For example, the average CEO receives hundreds of emails a day, with many spending over half their waking hours using electronic communications. It all adds up to fragmented work patterns and lifestyles, with no time for rest, exercise and reflection. The result? Bad decisions, poor health and limited performance for individuals and companies alike. Drawing on the latest academic research, the paper proposes that business leaders encourage their people to ‘shift gears’ at the right time. This involves moving into ‘high gear’ to tackle demanding duties, dedicating time for ‘low gear’ relaxation, and cutting back on ‘medium gear’ switching between tasks. Businesses should also create working environments where people can explore their creativity: the antidote to overload and boredom. To get things moving, bosses should lead by example: changing their own behaviours, and cascading new approaches across their businesses. Ironically, the cause of our distractions – technology – could also save us from them. The paper highlights digital technologies that are working wonders in companies to improve employees’ wellbeing. What of the future? Advanced technologies, such as artificial intelligence, look set to take on a lot of work, leaving people bored, depressed and ill. To avoid problems tomorrow, it’s essential businesses nurture people’s skills, talents and health today. Because finding ways to focus in our fragmented world isn’t just good for people’s wellbeing. It’s the only way businesses will succeed. To download your copy of the white paper, click here.